Welcome to 'Fine Lines', the Friday feature in which we give a sentimental, sometimes-critical, far more wrinkled look at the children's and YA books we loved in our youth. 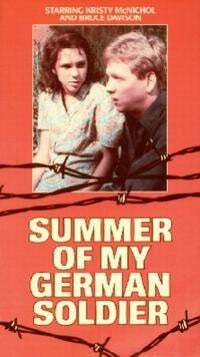 This week, writer / reviewer / blogger Lizzie Skurnick rereads 'Summer of My German Soldier', Bette Greene's 1973 book about Patty Bergen, who fears her father more than an escaped Nazi. What can we say about a Jewish dad who beats the hell out of his daughter? It is not, to say the least, the common literary conception of "Jewish Dad" found in most old-school YA, where, when Tate is in evidence at all, he is generally a hardworking sort stamping down rags and letting his children choose books from his store, or a kindly dentist dubbed "Dodo bird" by his adoring daughter. (Do your reading for next week, ladies!) In fact, excepting stepfathers, genuinely beastly fathers are rare in YA: while they run the gamut from switching their daughters to make a point (oh, Pa!) to calling them fat and useless, I can't think of any other instance where one whips off his belt to beat his daughter by the side of the road...before he even knows she's sheltering a Nazi. "When I was a girl," said my mother, turning towards Mrs. Fields, "I used to drive my mother crazy with my clothes. If my dress wasn't new or if it had the slightest little wrinkle in it I'd cry and throw myself across the bed." "You were just particular about how you looked," said Mrs. Fields. "I wish Patricia would be more particular," Mother said with sudden force. "Would you just look at that hair?...Here. Go look in the mirror and do a good job. You know, Gussie, you'd expect two sisters to be something alike, but Patricia doesn't care how she looks while Sharon is just like me." Didn't mother know I was still standing here?...I took in my reflection: "Oh, mirror mirror on the wall, who's the homeliest one of all?" Mrs. Fields smiled her adult-to-child smile. "How are you enjoying your vacation? As much as my niece, Donna Ann?" I wondered how I could honestly answer the question. First I'd have to decided how much I was enjoying the summer — not all that much — then find out exactly how much Donna Ann Rhodes was enjoying it before trying to make an accurate comparison. Mrs. Fields' smile began to fade. Maybe she just wanted me to say something pleasant. "Yes, ma'am," I answered. "Hey, Ruth!" She looked up from her wash. "Ruth, know where I was? With the Germans going to the prison camp!" She gave me her have-you-been-up-to-some-devilment look. "I didn't do a single thing wrong!" I said...."This is still my week to be good and sweet. I haven't forgotten." Her face opened wide enough to catch the sunshine. "I'm mighty pleased to hear it. 'Cause before this week is through, your mamma and daddy gonna recognize your natural sweetness and give you some back, and then you gonna return even more and—"
"Maybe so," I interrupted her, and she went back to putting bed sheets through the wringer, understanding that I didn't want to talk about them anymore. At his temple a vein was pulsating like a neon sign...He pointed a single quivering finger at me. "If you don't come here this instant I'll give you a beating you're never going to forget." ....Fingers crossed, I stepped through the opening in the hedge to stand soldier-straight before my father. One one foot advanced before a hand tore against my face, sending me into total blackness. We never know exactly, but we do understand that it is partly her parents refusal to love Patty — to even recognize her—that puts her in the way of Anton Reiker, the POW who, like Ruth and her grandmother, finds much in Patty to respect and like. When Jenkinsville becomes the site for a POW camp housing German prisoners (this kind of thing apparently totally happened!) Patty, who is so open to the outside world she actually instinctively waves at the prisoners, is disappointed by the banal nature of the crew: "In the movies war criminals being hustled off to prison would be dramatic. But in real life it didn't seem all that important. Not really a big deal. My stomach growled, reminding me it must be nearing lunchtime." ...he was looking at me like he saw me—like he liked what he saw. "I'll take the one you choose," said Reiker. He placed six yellow pencils and three stenographic pads on the counter. "And you did not tell me," he said, "what you call these pocket pencil sharpeners." "He was so nice. How could he have been one of those—those brutal, black-booted Nazis? "Well, I don't think they actually call them much of anything, but if they were to call them by their right name they'd probably call them pocket pencil sharpeners." Reiker laughed and for a moment, this moment, we were friends. And now I knew something more. He wasn't a bad man. His mouth came open. "Jewish?" An index finger pointed towards me. "You're Jewish?" I thought he knew. I guess I thought everybody knew....As I nodded Yes, my breathing came to a halt while my eyes clamped shut. Suddenly, strong baritone laughter flooded the room...'It's truly extraordinary," he said. "Who would believe it? 'Jewish girl risks all for German soldier.' Tell me, Patty Bergen—" his voice became soft, but with a trace of hoarseness—"why are you doing this for me?" It wasn't complicated. Why didn't he know? There was really only one word for it. A simple little word that in itself is reason enough. "The reason I'm doing this for you," I started off, "is only that I wouldn't want anything bad to happen to you." All this, baritone laughter, little-words aside, as you can imagine, does not end well. In fact, it ends about as badly as you could expect (if you'd like to not know, stop reading now) with Anton dead, shot by the FBI, and Patty in juvenile detention — more estranged from her family than ever, having humiliated them in the eyes of Jenkinsville, the larger Jewish community, and America as a whole beyond reason. "I want you to tell Ruth the truth about something. You hear me talking, girl?" I nodded Yes. "You tell me who is that man." ..."The man is my friend," I said at last. Ruth signed like she sometimes does before tackling a really big job. "He's not the one the law's after? Not the one from the prison camp?" Her forehead crinkled up like a washboard. "You telling me, Yes, he's not the one?" "No, Ruth, I'm telling you yes. Yes, he's the one." Ruth's head moved back and forth in a No direction. "Oh, Lord, why you sending us more, Lord? Don't this child and me have burden enough?" But Ruth also knows that Patty wouldn't be Patty if she could refuse Anton's friendship, and she also knows that Anton gives it back in kind: "That man come a-rushing out from the safety of his hiding 'cause he couldn't stand your pain and anguish no better'n me." Patty — and Ruth, and Anton — all have a funny kind of courage, the kind that never gets anyone the kind of medals brandished by the soldier herding the POW prisoners into the truck. Like many others, they're not persecuted for what they do—they're persecuted for what they are. But however much they are hated, they are still not people who can hate. Now, for the winner of this week's challenge: Congratulations, one Rhadika B., whose self-proclaimed "lame guess" was in fact the only correct one: Sooner or Later by Bruce and Carole Hart, the most passed-around flashlight bunk-book of my era. Seriously, how weirdly pervy is this cover? I want to add double well-played to Rhadika, since actually I totally forgot to add that the boyfriend was a musician, and actually the hair of the CHARACTER is red, but the hair on the cover really isn't all that red. Take this as a lesson: Never run yourself down! That is for other people who don't know what they're talking about. Rhadika, you've earned the right to demand a column of your choosing. Email me at jezziefinelines@gmail.com to claim your booty. Shoutout also to Beth D., who answered a question I didn't even know was a question: For all of those who didn't know what I was talking about last week, the book about the kids solving a mystery involving St. John the Divine and a genie is Madeleine L'Engle's The Young Unicorns, a wonderful, wonderful work that marks the point where L'Engle begins to port Vicky Austin into wacko supernatural territory. Still, my favorite has always been Dragons in the Waters, which stars Polly O'Keefe (I am a Polly! ), Meg's daughter, on a freighter, where they also get into all this mishegos involving the Quiztano Indians, who I think are also in a Swiftly Tilting Planet, along with all that Madoc Maddox stuff? Are they? Oy, maybe we should just do L'Engle for like six months and work this all out. Here is what I remember....There, for some reason I don't remember why, aren't any adults left. The main character is this girl and her brothers and sisters who have to learn to live on there own. They learn to drive a car and they're always driving around looking for food. At one point thers is some bird in a cage. The bird is a big deal, I can't remember why. They are always worried about this gang of bad kids so they carry around baseball bats to defend themselves. The end up fighting the gang and being able to live in peace. There are some sexual overtones at points. It's very gritty. It's not like the Boxcar Children or anything. I remember the cover of the paperback version we had had this dark blue cover with a picture of a girl getting out of a car in the rain...It was all about survival. If you know the answer, either stick in it the comments or email me at jezziefinelines@gmail.com. Send intemperate demands to same. First correct gets it, and I will announce the winner next week!